It is indicated in water and sodium depletion. It provides Dextrose as a nutrient in a suitable medium of Sodium Chloride or it may also be employed as a source of Sodium Chloride. It is usually used in the maintenance and replacement of fluid, electrolyte and carbohydrate in patients (especially for neonates & infants) who are unable to take fluid and nutrients by mouth e.g. in case of persistent vomiting, during and after surgery, shock or accidents. 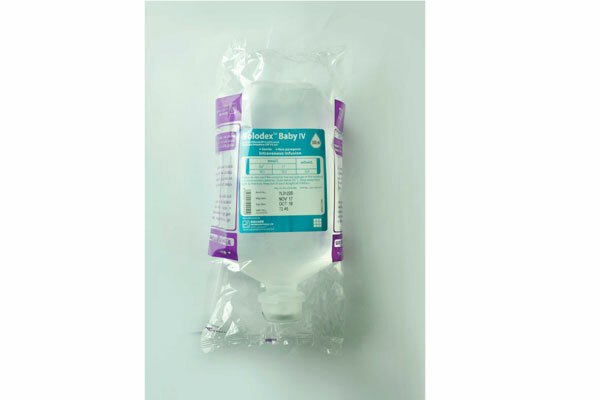 Solodex TM Baby IV Infusion, 500 ml: Each 100 ml solution contains Sodium Chloride BP 0.225 gm and Dextrose Anhydrous USP 5 gm.